This is to document some worrying experiences with Holmer Vets from September 2015, which in our opinion point to negligence and incompetence. Before that date, we had no issues. 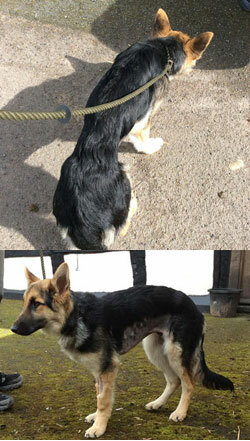 We also have evidence to show that one of the vets participated in a hate campaign aimed at the trustees of GSDR. This evidence will make you call into question the professional integrity of one particular vet namely Meg Potter (neighbour Lynne Potters daughter) - especially as our beloved GSD Ted died while in her care in September 2015. Was it inexperience or wilful neglect that lead to his death? This is the story of Lad, a 6-month-old puppy who was treated by them in March 2016 after becoming very unwell. Had we not eventually removed him from their practice, we have no doubt that he would have died. 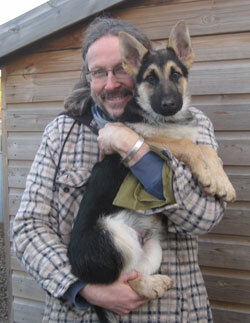 Lad with his Daddy at 5 months old. This is Lad with his daddy prior to him becoming ill. His first visit to Holmer Vets was on Friday 11th March 2016 when we became very concerned about his health. Before this, he was a normal healthy bouncy puppy but a little devil and into everything - including eating things he shouldn't! Below, we document exactly what happened during his stay at the vets and how he was treated. Friday 11th March - First visit as a result of Lad not eating, drinking, losing weight and generally unwell for several days. I expressed concern that he may have a blockage as he had been chewing things he shouldn’t have. Nafisa Farooqui the vet, administered antibiotics and anti-inflammatories. Saturday 12th March - returned to vets as Lad was deteriorating, he was still not eating and drinking and was dehydrating. Again voiced concern that he had a blockage, examined and admitted by John Bell. Put on a drip to rehydrate. Sunday 13th March - Discharged by John Bell but Lad was sick on the way home and continued to deteriorate. Wouldn’t eat, limited drinking. Monday 14th March - readmitted and put on a drip. Wednesday 15th March - We visited Lad in the evening, he had not improved in fact he looked terrible. We spoke to Nafisa and were staggered to learn that no barium meal or scan had been done despite his worsening condition. Lad Pictured On 19th March 2016. Thursday 17th March - Barium & scan finally done some 7 days after he was first presented. PM we visited and met with Nafisa who expressed that she was very concerned at the results. We were shown the X-Rays and I was horrified when I saw them. The gut was dramatically distended and there was clear evidence of a blockage. Nafisa then stated that he would be put on the list for surgery the following day! A BLOCKAGE IS A SURGICAL EMERGENCY AND THIS ONE HAD BEEN THERE SOME TIME - OVER 7 DAYS!! At approximately 10 pm on Thursday evening, we received a call from Phil Adams a senior vet to say that he had operated on Lad. Phil had obviously intervened and realised the emergency of the situation. An intussusception was found and Phil stated that he had gone in and got out quickly because Lad was so weak and poorly. Had he spent a few more minutes checking that all was OK, he would have discovered a second intussusception further down which should have been dealt with. Intussusception - This tends to occur in young pups and although the most common causes include worms, foreign bodies or toxic substances, the incidence in GSD's is much higher than any other breed indicating that it is immune mediated. Why didn't any of the vets at Holmer know this? Sunday 20th March - Lad was discharged by Rachel Allen who didn’t seem to know very much about him or his treatment. When we arrived home, it was clear that he was not improving but in fact continuing to deteriorate. He would not eat or drink and had now lost so much weight he was very weak. Monday 21st March - We tried all day to get seen and eventually Lad was readmitted as an emergency Monday evening and put back on a drip. 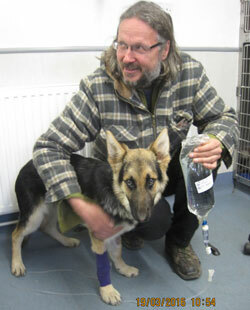 Tuesday 22nd March - No further tests had been done yet he was deteriorating. Wednesday 23rd March - John Lewis visited Lad in the afternoon but came home very upset and concerned for Lads’ welfare. Lad had been taken off the drip, he was not eating or drinking and it appeared that they had given up on him at the vets. One of the veterinary nurses was rude and dismissive to John. I immediately contacted an acquaintance who is a vet and explained the situation and was advised to get Lad to a referral centre asap. We phoned Holmer vets and demanded Lads release and that they arrange an immediate referral to Willows Hospital which was our nearest specialist centre. John Bell was reluctant to refer Lad and said he just needed time to recuperate, however, we insisted. We picked Lad up Wednesday evening, he looked terrible, very thin, weak and he was not eating or drinking. John Bell performed a scan and told us there was nothing wrong although Lad might have some adhesions. Bell would not organise a referral until the following day as he said it would be expensive as Willows load the out of hours costs - Bell was not paying the bill, we were! Lad was extremely poorly through the night and we were both worried that he would not survive. Thursday 24th March - John Lewis arrived at Willows just after 8 am. Lad was admitted as an emergency and around lunchtime, we received a phone call from Willows asking for our permission to operate as an emergency. They found a second intussusception which they described as having been there some time. We refused to go back to Holmer Vets for his post-operative checks because of their negligence and uncaring attitude. 30th March - Holmer refused to release Lads notes to Belmont Vets in Hereford for his post-operative check up unless we paid the bill for his treatment - very unprofessional. We have an account with Holmer and pay when statements are issued every 3 months. We have never missed a payment to them once statements are issued. We are disputing their invoice 1-68378 for £1326.78 and we are seeking reimbursement of our costs from Willows of £4959.70 as a result of their negligence, not to mention the suffering that they put this poor puppy through. They have never once contacted us to see how Lad was doing. This was a terrible experience for us all, especially our little Lad. From the very first day he was presented at Holmer Vets I had stated that I suspected a blockage. Why then were no proper diagnostic tests done until Thursday 17th March, a week after he was first seen? We have not been contacted by them since this happened, they have not chased their invoice and we are still waiting for their insurance company to contact us! 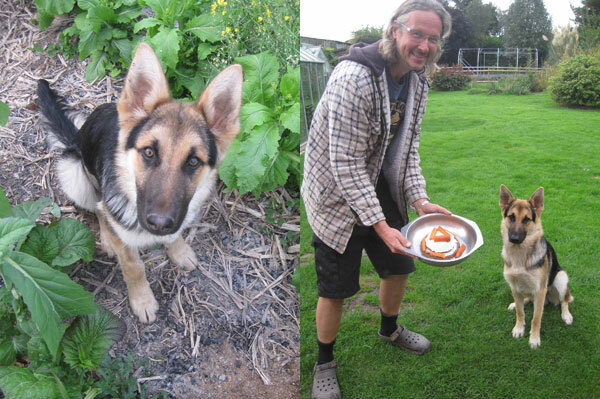 This is our little Lad after his ordeal on the left and on the right on his 1st birthday on 24th September 2016. Without treatment at the Willows Hospital, we believe that he would almost certainly have died had we left him in the care of Holmer Vets Hereford. We also have evidence that will make you call into question the professional integrity of one particular vet namely Meg Potter (neighbour Lynne Potters daughter) - especially as our beloved GSD Ted died while in her care in September 2015. Was it inexperience or wilful neglect that lead to his death?